A recent Bald Eagle Area High School graduate is the national finalist for his Community and Home Development project. At the same time, the Bald Eagle FFA chapter earned a 2-star rating in the national chapter application. They also will earn spurs for each year they compete and receive a rating from the National FFA Organization. Chapters that receive at least a national 3-star chapter rating will be eligible to compete for the National Premier Chapter, Models of Excellence and Middle School Models of Excellence awards. Mason Finocchio, who graduated in June 2018, is also a national finalist for a project he’s worked on to help fight hunger in the community. 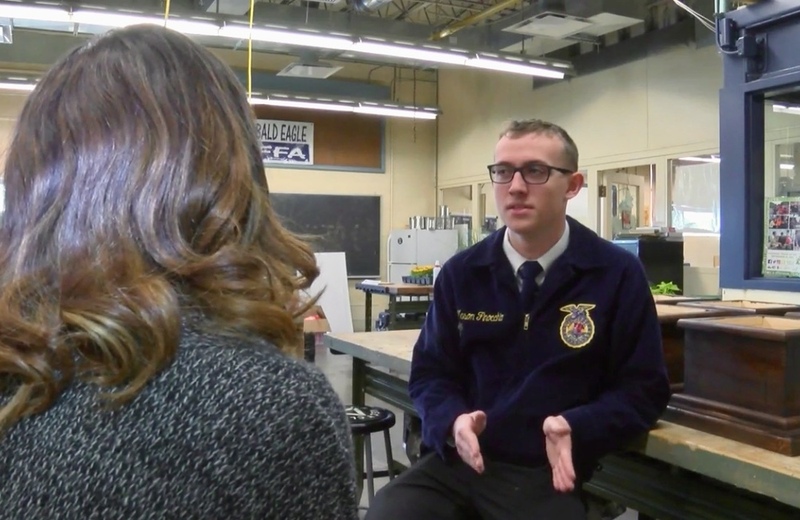 Ag teacher and FFA adviser Todd Biddle said being a finalist means Finocchio is one of the top four FFA students in the country, and is set to attend the National FFA Convention where he will go through a series of interviews and activities. Finocchio has been working for more than three years on the Knock Out Hunger initiative to help combat the hunger problem in the area. Finocchio completed his proficiency assessment on the hunger challenge, also known as the Knock Out Hunger program, at Bald Eagle Area School District, which was spearheaded by the BEA grad about three years ago. It came with help from a Foods for All grant that supported A Catered Affair, the Fresh is Better showcase and the purchase of incubators to hatch chickens. Since the program started in 2015, fundraising and outreaching events were held such as canning at the State College Spikes game, working with the FFA Foundation food stand at Ag Progress Days and participating in the Centre County Grange Encampment and Fair, which raised about $1,000 to put toward the YMCA’s Backpack Weekend Food Program. About $15,000 was raised for the backpack program through these fundraising efforts.